We had a wedding decoration setup for Nicklaus and Mandy at Connexion Conference & Event Centre at Bangsar South last weekend. This elegant marble backdrop is one of our favourite wedding trends in 2018. The bride and groom names has a gold foil die cut finishing to create an outstanding outcome for the backdrop. The side of the backdrop is decorated with 6 units of gold metal stands and each stands has pastel pink, peach and ivory colour roses. Beyond the traditional use of light grey and white tones, we are now seeing marble effect on wedding cards, wedding stationery, wedding cakes, welcome signages, centerpieces with marble effect, etc. 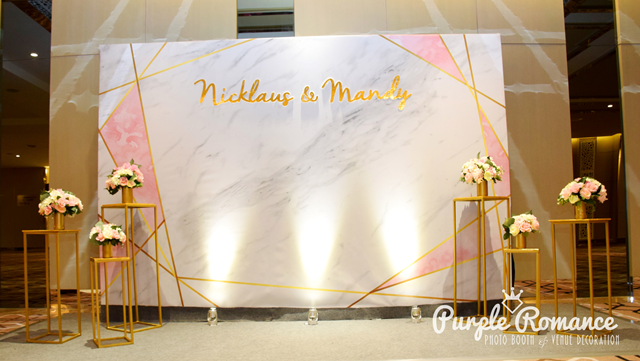 Marble is a natural stone and it isn't a cheap material to be used for a backdrop, hence we designed a printed marble version of backdrop with pink watercolour to brighten up and finished with the gold names on the board. We fall in love with this natural and neutral styling as it also can be incorporated with modern romantic, elegant with luxurious style to rustic greens. Besides wedding backdrop, the marble backdrop is also suitable for corporate annual dinner, product launching event, opening ceremony, birthday event, etc. Need a backdrop and decorations like this? Enquire now at 0189193911 (Whatsapp is available). Instant print service can be added in at a discounted rate.